A new report from AAA reveals that the majority of U.S. drivers seek autonomous technologies in their next vehicle, but they continue to fear the fully self-driving car. Despite the prospect that autonomous vehicles will be safer, more efficient and more convenient than their human-driven counterparts, three-quarters of U.S. drivers report feeling afraid to ride in a self-driving car, and only 10 percent report that they’d actually feel safer sharing the roads with driverless vehicles. As automakers press forward in the development of autonomous vehicles, AAA urges the gradual, safe introduction of these technologies to ensure that American drivers are informed, prepared and comfortable with this shift in mobility. In 2016, a AAA survey found that three-quarters of Americans reported feeling afraid to ride in a self-driving car. One year later, a new AAA survey found that fear is unchanged. While the majority are afraid to ride in a fully self-driving vehicle, the latest survey also found that the majority (59%) of Americans are keen to have autonomous features in their next vehicle. This marked contrast suggests that American drivers are ready embrace autonomous technology, but they are not yet ready to give up full control. 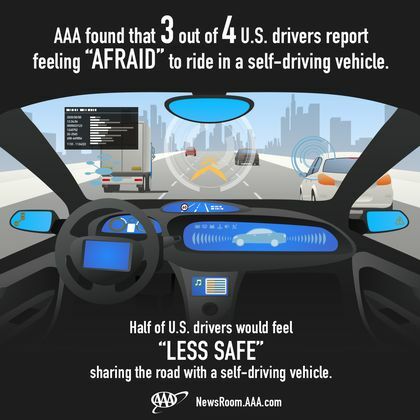 Half (54%) of U.S. drivers feel less safe at the prospect of sharing the road with a self-driving vehicle, while one-third (34%) feel it wouldn’t make a difference and only 10 percent say they would feel safer. Women (58%) are more likely to feel less safe than men (49%). The majority (59%) of U.S. drivers want autonomous vehicle technology in their next vehicle, while the remainder do not (25%) or are unsure (16%). Millennials (70%) are the most likely to want the technologies, compared to Generation X (54%) and Baby Boomers (51%). Three-quarters (78%) of Americans are afraid to ride in a self-driving vehicle. Baby Boomers (85%) are more likely to be afraid than Millennials (73%) and Generation X (75%) drivers. Women (85%) are more likely to be afraid than men (69%). To educate consumers on the effectiveness of emerging vehicle technologies, AAA is committed to the on-going, unbiased testing of automated vehicle technologies. Previous testing of automatic emergency braking, adaptive cruise control, self-parking technology and lane keeping systems has shown both great promise and great variation. This variation may be particularly concerning to consumers, with AAA’s survey revealing that 81 percent of Americans feel that automated vehicle systems should all work similarly and consistently across all vehicle manufacturers. Future AAA testing will look at how well systems work together to achieve higher levels of automation.